Published: Sept. 28, 2017 at 02:37 p.m. Updated: Oct. 1, 2017 at 11:56 p.m. I honestly can't believe we're nearly a quarter of the way through the season. On the one hand, it feels like so much has happened and we've learned so much, but on the other hand, we really truly don't know (expletive). That's kind of the beauty of fantasy football though. We must celebrate the ecstasy of our smart calls, and also endure the agony that comes when you bench Stefon Diggs in your most important league, as I did last week. Alas, with Week 4 upon us we must turn our eyes to the future and a great slate of games and try to predict who will rise up in glory on the gridiron for our fantasy amusement. It should be a lot of fun, and after the amazing games we were treated to last week, I'm dying for Week 4 to kick off already. As always, this is where I go game-by-game and player-by-player for every Week 4 contest. Those looking for quick-hitting start/sit/flex/stream analysis will find that listed for the main players for every team. Below that, I do my best to preview the game with additional insight, stats, and analysis to contextualize my recommendations. This process is going to evolve as I get better at writing this thing solo, and we get more data the further we get into the season. This column wouldn't be possible without our incredible research teams, both @NFLResearch and the fine folks at Next Gen Stats. So thanks to all of you and all that you do. Now, enough blathering on. We've got lineups to set and matchups to explore. Time to dive in. Kirk Cousins has been slowly heating up this season, finally culminating in an awesome fantasy performance last week against the Raiders (365 yards, three touchdowns, no turnovers). He's a QB1 this week against a Chiefs secondary still figuring out how to operate post-Eric Berry. Rob Kelley sat out last week with a rib injury, but if he returns he'll be a low-end flex option. The team seems committed to not saddling the electric Chris Thompson with too many touches, though he saw 14 last week and absolutely dominated (188 total yards and a touchdown). While his insane touchdown output will fall back to Earth soon, Thompson's simply too efficient right now to worry about sitting; 10-15 touches a game is all he'll need to produce as a flex, especially in PPR. As Matt Harmon notes in his excellent Next Gen Stats sleepers piece, this could be the game where Terrelle Pryor and Jamison Crowder finally get going. The Chiefs are top-three in yards allowed to slot receivers and left wide receivers, and Pryor takes 63 percent of his snaps at left wideout while Crowder spends 67 percent of his time in the slot. This figures to be a high-scoring game, so it's likely now or never for these two in your lineup. Whichever tight end starts for the Redskins should be starting in your fantasy lineup, though Vernon Davis is only in play if Jordan Reed is out (he kind of disappears with Reed in the lineup). Washington's defense is sneakily good at pressuring the quarterback, and that came to fruition last week as they totally shut down Derek Carr and the Raiders. Alex Smith has been sacked three-plus times in every game so far, which puts Washington on the streaming radar as they head to Kansas City. Was 2017 the year of the rookie RB in fantasy? The nice thing about the Chiefs offense is how easy they make it for fantasy owners. We know we're starting their three primary playmakers -- Kareem Hunt, Tyreek Hill, and Travis Kelce -- because they're high-volume players and the focal points of this offensive attack. Alex Smith is once again on the streaming radar in a home matchup with a solid defense. He has multiple touchdown passes in two of three games so far, and Washington has allowed at least one passing touchdown in all three games. Kirk Cousins has been sacked four, two and one times in his three games, and the Chiefs have multiple sacks in every game so far this year. At home, they should be able to get home against Cousins a few times and potentially force him into some turnovers (which he has avoided since Week 1). The Bears sure are making it easy for us fantasy analysts (well aside from the whole Jordan Howard being injured all week, leaving the team facility in a sling, and then absolutely DOMINATING in Week 3 thing). Howard took his 28 touches for 164 yards and two touchdowns against the Steelers on Sunday. He is back in the RB2 mix moving forward, pending any setbacks with his shoulder injury (he was not listed on the team's injury report on Monday for what it's worth). The Packers defensive line is decimated with injuries right now, and constantly allowed space for Joe Mixon to run through last week. Tarik Cohen remains in the mix as a weekly flex play, especially in PPR formats as the rookie leads all running backs in targets (25) and receptions (20). As for the wide receivers/passing game in general, woof. Mike Glennon is averaging just over 200 passing yards per game with three total touchdowns and three interceptions. The wide receivers are a non-factor, but tight end Zach Miller retains low-end PPR value. Vic Fangio's defense has impressed in the early portions of the 2017 season, but I'd steer clear of rostering this group on the road in Green Bay after an emotional overtime win over the Steelers. Don't sleep on this Bears defense and its ability to slow down Aaron Rodgers. Thus far in 2017 they allow 253 yards and one touchdown per game, and that includes games against Matt Ryan, Jameis Winston and Ben Roethlisberger. In four games against the John Fox-Vic Fangio brain trust, Rodgers averages 242.3 passing yards, 24 rushing yards, 1.75 passing touchdowns, and .25 interceptions per game (or around 18.5 fantasy points). Granted, last year with Jordy Nelson in tow Rodgers' performances were much better (289 ypg, 3 TD, 0 INT), though he went touchdown-less in one game -- Ty Montgomery's breakout performance. For whatever reason, Montgomery owned the Bears last year, with 48.6 percent of his rushing yards and two of his three touchdowns coming against his Windy City Rival. To date, the Bears allow just 3.5 yards per carry with three rushing scores and just 88 receiving yards to opposing backs. Montgomery continues to be a workhorse for Green Bay, though, and is a low-end RB1. As for the pass-catchers, Jordy Nelson and Davante Adams remain must-starts, though Randall Cobb looks to return this week after practicing in full on Tuesday. Geronimo Allison got into the mix in Cobb's stead but falls back off the radar if Cobb suits up. Martellus Bennett has seen 21 targets this year, but has turned those into just 11 catches for 102 yards. He should be sat until he turns his play around, though this is technically a #revenge game, if you're into that. The Packers defense at home would normally be a sound play, but with Mike Daniels still limited and Nick Perry attempting to play with a massive club/cast, it's probably best to look for a streamer elsewhere. The Saints offense surprisingly got right against the ferocious Panthers defense in Week 3, with Drew Brees throwing three touchdowns after throwing that many combined in Weeks 1 and 2. Next up, Brees and the Saints face a Dolphins team that was just thoroughly outplayed on both sides of the ball by the New York Jets. Further benefiting the Saints is their early arrival in London, as the Dolphins won't arrive until later in the week. That extra time to acclimate to the different time zone cannot be discounted here. Brees is a top play this week against a Dolphins secondary allowing 290 yards per game (fifth-most). The Saints backfield remains a bit of a mess, though Mark Ingram offers low-end flex appeal (he leads the team with 39 touches and 233 total yards), while Alvin Kamara could be used in deeper formats (second on the team in targets and has the backfield's only TD). Adrian Peterson cannot be used at this time, especially after suffering a knee injury in practice. Michael Thomas finally found the end zone and was featured in the passing attack, with five catches for 50 yards and a score on five targets on the first drive. He's back in the WR1 mix against the Dolphins this week. Speaking of back, hello Willie Snead! Everyone's favorite summer sleeper returns from his three-game suspension in time for a prime matchup. It's risky starting Snead given he hasn't played a regular season snap yet, but his upside is big with the Saints likely to put up plenty of points. Snead's arrival does put an end to the fantasy value of Coby Fleener, Ted Ginn, and Brandon Coleman (for now). Fleener played just 14 snaps last week, while Ginn or Coleman will lose significant playing time to Snead. You don't need to drop either just yet, but watch their usage closely on Sunday. There's no reason to mince words here: the Dolphins offense was an abject disaster in Week 3. In a great spot against the Jets defense, they managed one touchdown ... on the final play of the game. That being said, there's reason for optimism again this week as the team travels to London to face a Saints team currently allowing the second-most total yards and third-most points through three weeks. Jay Cutler and his entire passing attack will once again be starting-caliber plays this week, with DeVante Parker the better play in standard and Jarvis Landry a strong PPR option, though the Saints have allowed the second-most yardage (279) to wide receivers from the slot. Kenny Stills has 15 targets through two weeks and is a deeper league play or daily fantasy option. Jay Ajayi is dealing with a knee injury and his status will need to be monitored before this game kicks off (early on Sunday, too, so set your alarm). If he starts, he's in a good spot to bounce back. He received just three touches in the second half last week, and the Saints allow more yards to running backs thus far (610) than any other team in the league. Julius Thomas averages four targets and 21 receiving yards per game and shouldn't be in streaming consideration until his usage improves. Marcus Mariota surprisingly bounced back in Week 3 against the Seahawks, throwing multiple touchdowns for the first time in his last six games. He'll try to keep the momentum going on the road against a tough opponent this week. The Texans allow 242 yards and two touchdowns per game thus far, but if you take out Tom Brady's epic performance last week (378 yards, five touchdowns), they've allowed 174.5 yards per game and a single touchdown. Mariota figures to fall somewhere in between those two averages with Houston's secondary still a bit banged up, and is a fine low-end starter. DeMarco Murray is healthier than the world expected, apparently, as he put together an impressive performance on Sunday capped off with a 75-yard touchdown run. He's back in the RB2 mix now that we know he's at least capable of splitting carries with Derrick Henry (they saw 14 and 13, respectively, in Week 2). Speaking of Henry, he disappointed against the Seahawks, partially because he suffered a thigh bruise in the first quarter. He's a low-end flex play heading into this contest while sharing work with Murray. Corey Davis missed last week with a hamstring injury and is out again. Eric Decker simply isn't doing enough with his minimal opportunities to warrant starting consideration. Rishard Matthews, however, has quietly established himself as Mariota's most trusted target. He leads the Titans in targets (24), receiving yards (201), and trails only Jonnu Smith in touchdowns (one vs. two). Delanie Walker has two top-12 scoring finishes through three weeks this year, and is second on the team in targets (19) and yards (168). He's a weekly lock in starting lineups for season-long players. The Titans defense is a solid unit, but could struggle to sack the elusive Deshaun Watson and as a result may not produce up to expectations, especially on the road. Deshaun Watson looked poised as a passer in Week 3 as he nearly upset the Patriots, and now gets a comfy matchup in his home stadium this Sunday against the Titans. Tennessee has been gashed through the air, allowing the seventh-most passing yards per game (286) and the sixth-highest touchdown rate (6.1 percent). Mobile quarterbacks have been able to run on this defense, too, as Russell Wilson and Blake Bortles combined for 57 yards on the ground versus the Titans in the last two weeks. Lamar Miller's percentage of the backfield opportunities (targets plus carries) has fallen with each passing week of the season, from 68 percent to 55 percent to 54 percent. The emergence of D'Onta Foreman as a powerful change-of-pack seriously dings Miller's outlook. Over the last two weeks Miller is the RB30 in standard, while Foreman is the RB34. Both are low-end flex plays against a Titans front that allows just 3.5 yards per carry. Courtesy of Rich Hribar over at Rotoworld, we know that the Titans are the only team to allow a top-12 scoring finish to an opposing wide receiver in every week so far this season (after leading the league with 12 such weeks last year). This puts both DeAndre Hopkins and Bruce Ellington into focus. The latter's return from a Week 1 concussion really opens things up in this passing attack, as Watson has a reliable threat opposite Hopkins. Hopkins owned over 48 percent of the team targets through two weeks, but saw "just" 24.3 percent in Week 3. Even with a smaller share of the targets, Hopkins will have solid touchdown upside, as only six teams have conceded scores to opposing wideouts more frequently than the Titans. With C.J. Fiedorowicz on IR, Ryan Griffin absorbed 18.2 percent of Watson's targets last week, amassing five receptions for 61 yards and a score. So far only seven teams allow more receptions and yards to tight ends than the Titans, making Griffin worth a stream. The Texans defense at home would seem like a good play, but through three games opposing defenses have combined to score zero fantasy points against the Titans ground-and-pound offense. Mariota has been sacked just twice all year behind an offensive line only allowing him to be pressured on 17.2 percent of his dropbacks (eighth-lowest). The Jaguars figure to win this game, and so far Blake Bortles averages eight more passing attempts per game in losses than victories. That could dampen any hopes of Bortles as a streamer this week, especially since the Jaguars are currently tied for the league lead with 99 rush attempts and have the third-highest running percentage in the league. This is good news for Leonard Fournette, who will look to keep his strong early start to the season going. Fournette averages 23 opportunities per game (targets + carries) and has scored in every game. This is thanks to his usage near the goal line, as only Todd Gurley (eight) and Carlos Hyde(seven) have more carries inside an opponent's 5-yard line than Fournette (six). Marqise Lee and Allen Hurns are on the low-end flex radar this week in a solid matchup. Over the last two weeks Lee leads the way with 19 targets, 11 catches and 141 yards, but it's been Hurns who has caught the two scores, thanks to four targets in the red zone to Lee's two. Don't chase Marcedes Lewis' production. I feel this should be a given, but there are plenty of casual players out there. As Matt Harmon noted, Lewis had three touchdowns combined from 2014-2016 prior to his three-touchdown outburst in London. The "Sacksonville" defense leads the league with 13 sacks and four fumble recoveries, while their four interceptions rank third. The Jets have given up at least one sack and one turnover in every game. For the most part, this Jets offense is simply too unpredictable to chase fantasy-wise. Josh McCown has been OK as a fantasy quarterback the last two weeks, with 15.74 and 14.66 point performances, but there are far better options to stream. Elijah McGuire keeps getting action in this backfield, which is worrisome. However, if Matt Forte misses time with a toe injury (X-rays were negative, but he's likely out this week) that might make Bilal Powell a bit more trustworthy. I'd roll with Powell if you have him and hope for the best. The Jaguars allow 4.8 yards per carry to opposing backs and are 32nd in Football Outsiders' rushing defense DVOA. Jermaine Kearse and Robby Anderson have alternated touchdown weeks, but neither is receiving a reliable amount of targets. Austin Seferian-Jenkins is an interesting tight end streamer, though. He tied for the team lead with six targets and was on the field for 78 percent of the offensive plays in his first game back from suspension. The Jaguars have also been a bit vulnerable to the position, allowing three touchdowns (two receiving, one rushing) to the position the last two weeks. Don't start the Jets defense, even against Blake Bortles. Something is not right with Cam Newton right now, likely due to his offseason shoulder surgery. After disappointing in a big spot last week at home against the Saints, Newton needs to be benched until we see signs of Superman once again. Newton's struggles do mean good things for the backfield, especially Christian McCaffrey. With Newton not able to push the ball downfield as much, Run CMC has been pummeled with targets. He currently ranks second among backs in targets (23), receptions (18), and receiving yards (173). He's a solid floor-based flex play with more upside in PPR. Jonathan Stewart is less attractive than McCaffrey in this current Panthers offense, but still offers a decent floor and some scoring upside. The good news is Kelvin Benjamin's knee injury doesn't appear to be serious. The bad news is you probably don't want to start him this week on the road. This could put Devin Funchess into the deep sleeper mix, but I'm nervous about how well this whole group will be able to move the ball -- even though this version of the Patriots defense is a far cry from the dominant units of recent memory. Ed Dickson has four targets in the last two weeks, and isn't rosterable. The Panthers defense will have plenty of usable weeks on the horizon, but a road trip to New England isn't one of them. Tom Brady has thrown for 825 yards, eight touchdowns and no interceptions in his last two games. You're starting him. Mike Gillislee is the back to trust right now, as he's always a threat for a touchdown and the Patriots are home favorites here. James White lost passing game work to Dion Lewis last week, and with the wide receivers getting healthy, they absorbed 18 of Brady's 25 targets. Speaking of, Brandin Cooks finally got going and Chris Hogan found the end zone (again). They're both weekly flex plays for this high-powered offense. In his first game back from a concussion, Danny Amendola caught three of five targets for 48 yards. I'd give him another week before starting him, even in PPR formats. Rob Gronkowski is always in your starting lineup. The Patriots defense is still injury-riddled, and while a matchup with the struggling Panthers sounds tasty, I'd consider them a low-end streamer at best. I'm slightly concerned about Matthew Stafford on the road against a talented defense, but I think his offensive weapons should be able to help him post reasonable starting numbers. If there's a viable streamer available, though, don't be afraid of sitting Stafford. Golden Tate operating in the slot should keep him away from Xavier Rhodes, and with the running game stalling, most touchdowns should conceivably come from Stafford's right arm. Speaking of that running game, Ameer Abdullah is a talented player but his role is the absolute worst for fantasy. He loses receiving work to Theo Riddick and goal-line work to literally everyone else. Riddick has seen seven-plus targets twice this year, and could be heavily featured as a way to slow down the Minnesota pass rush and move the chains. He's a nice PPR play. As mentioned, Tate should be locked into starting lineups as he'll avoid Rhodes. Marvin Jones might not merit shadow coverage from Rhodes in this one, as in Week 1 the Vikings left him at the right cornerback for most of the game. That would work in Jones' favor as his most frequent position is on the right offensive side of the field (51 percent) which also happens to be Minnesota's weakness, as they've allowed the second-most receiving yards (256) to players in the wide right position. We've also seen deep threats/secondary receivers get over on this Vikings defense (Martavis Bryant, DeSean Jackson), and Jones currently owns the highest targeted air yards average (19.2) on the Lions. He's an upside play in the flex. Kenny Golladay has actually out-targeted Jones (15 to 13), but his playing time (60 percent) leaves something to be desired. Deep league players could flex him in the hope he is the deep threat to get behind this Vikings secondary, but by now the risk with Golladay should be apparent (three catches for 33 yards in the two games since his Week 1 explosion). Eric Ebron is far from a consistent player, but he's receiving consistent targets (five per game) at least, and when it comes to tight ends that's hard to turn away from. The Lions defense had a surprise game last week, but don't expect a repeat here. I owe Case Keenum and this entire Vikings passing attack an apology. I did not believe they, collectively, were capable of the outing they put on display last week (though that was largely because of Keenum). Nevertheless, the beautiful thing about fantasy football is now we take that information/data, adjust perceptions and move onto the next week. Which is why I think Keenum is worth streaming against a Lions secondary currently allowing 267 passing yards per game (11th-most). Their 4-7 TD-INT split looks frightening, but a few of those picks were opportunistic tips/drops from opposing wideouts. Their deep passing (20-plus air yards) defense has been solid thus far, allowing just two completions on 16 attempts for 56 yards and a touchdown, but last week Keenum went 7-of-9 for 221 yards with two touchdowns on passes of 15-plus air yards. At home, Keenum's in a solid spot to perform. Through two weeks Stefon Diggs and Adam Thielen rank first among wide receiver duos in receptions (36), yardage (592) and receiving touchdowns (four). They're going to be tough to sit from here on out if Keenum can display some semblance of consistency under center. Same goes for Dalvin Cook, who continues to look like the real deal. He has RB12, RB31, and RB5 performances through three weeks, and he trails only Kareem Hunt and Todd Gurley in scrimmage yards with 370. The Lions rank in the bottom 10 in the league in yards allowed to running backs, conceding 461 total. The Vikings defense will have a tough task against the Lions high-powered offense, but you have to like their floor at home. Tyrod Taylor, a favorite of the NFL Fantasy squad, has impressed thus far despite having basically an entirely new receiving corps. However, so far all of his success has come at home, which makes this road matchup a bit dicey. The Falcons have speed in the front seven, too, and could limit Taylor's rushing ability, which is a key to his fantasy output (his 106 rushing yards rank second among QBs). I'd look to stream the position instead. LeSean McCoy has disappointed in back-to-back weeks (against great defenses, mind you), and ranks as the RB39 in standard in that span. Can he get it going here? Atlanta was absolutely gashed by the Bears rushing attack in Week 1, and has allowed the 13th-most total yards to opposing backs. Stick with Shady again this week and hope at the very least his passing game upside can keep his value afloat against an Atlanta team that bleeds receptions (26) and receiving yards (220) to backs. We're still steering clear of these wide receivers, as Zay Jones leads the pack with a whopping 12 targets through three games. Charles Clay remains on the streaming radar, though, as his 18 targets are tied for eighth-most among tight ends, and he's found paydirt twice in three games. The Bills defense is normally a must-start, but Atlanta's offense at home is reason enough to sit them. Only one defense has yet to allow a passing touchdown this season, and that is the Buffalo Bills. I'd expect Matt Ryan to buck that trend on his home court, but expectations should be lowered for this whole passing attack when the surprisingly stout Bills defense comes to town. They allow just over 6 yards per attempt and have 10 sacks on the year. Mohamed Sanu should go back to the bench, but Julio Jones remains a must-start because, well, he's Julio Jones. Sorry if you need more analysis than that. As for the backfield, Devonta Freeman is out-touching Tevin Coleman 59-29 on the season, and 10-two in the red zone. That's why Freeman has four touchdowns to Coleman's one and remains the better play. The Bills allow just 3.3 yards per carry to opposing backs, but Freeman's workload should still offer him a safe floor. Coleman is a volatile flex play, though the Falcons could attempt to use his speed in space to attack the Bills defense. Austin Hooper now has six targets total through three games and isn't even on the streaming radar. The Bills offense has only committed one turnover and Tyrod's been sacked nine times, but without Vic Beasley out the Falcons defense is probably just off the streaming radar. All is not right with the Pittsburgh offense and a road matchup with one of the NFL's best defenses is not what the doctor ordered. Ben Roethlisberger looks a bit off in 2016, and with his historic home-road splits likely to rear their ugly head here I'd leave him on the bench. Le'Veon Bell finally found the end zone last week, and his 65 touches are tied for fifth-most among all NFL backs. The Ravens defense is formidable, but you're starting Bell. Same goes for Antonio Brown, who has been the most consistent piece of this offense so far. He leads all wide receivers in catches and yards through three weeks. Martavis Bryant and Big Ben simply aren't on the same page right now, as evidenced by their numerous missed connections on deep passes. He's a fine ceiling play for those looking to add an explosive element to their lineups, but I'm sitting him in this matchup. The Ravens just allowed three touchdowns to Marcedes Lewis and tight ends are a great way to attack this defense, so if you're feeling an extreme level of YOLO this weekend, stream Jesse James. Joe Flacco has been sacked five times and thrown four interceptions in a little under three games of work. The Steelers are a solid streamer on the road, especially if T.J. Watt (groin) plays. So far, the only teams the Ravens have gained more yards than are the Buccaneers and Dolphins ... who didn't play in Week 1. Joe Flacco is unstartable right now with this passing attack grounded behind a shaky offensive line as he battles a back injury. An astute podcast listener notified us that Kareem Hunt has more rushing yards than Flacco has passing yards in 2017. He's really not even worth a roster spot at this point. This Ravens backfield, yeesh. It looked like Javorius Allen was set to take over, but Terrance West was healthy enough to play last week and got the start. Then, with the game out of hand, Alex Collins came into rack up garbage-time production (seven of his nine carries came in the fourth quarter with the Ravens down 44-0. Allen remains the best play of the bunch thanks to his passing game work (13 targets trail only Jeremy Maclin on the team), though West could also be worth a low-end flex in standard formats. Collins needs to be added, but let's see if his role expands into competitive territory first. I'm sitting all members of this passing attack aside from Benjamin Watson. It's a low-volume group on the receiving end of passes from a sub-100-percent quarterback. Breshad Perriman and Mike Wallace combined have four catches for 26 yards on 18 TARGETS. Puke. Watson's playing time decreased from Week 2 to 3 which is disconcerting, but he did find the end zone. In a more competitive game at home, I still like him as a streaming option. With the Ravens playing at home against a Steelers offense that has yet to hit its stride, this defense is definitely in play and should rebound after a disastrous trip to London. Ah, now that's the Andy Dalton we're more accustomed to seeing. Feeding A.J. Green is never a bad thing, and that's what Dalton did last week under the guidance of new offensive coordinator Bill Lazor. The duo connected on 10 of 13 targets for 111 yards and a touchdown. Expect more of the same this week against a Browns secondary that was just gashed by Jacoby Brissett and T.Y. Hilton. It's pretty clear from Lazor's first game running the show that he intends to feature Joe Mixon in a more prominent role. The rookie saw 62 percent of the backfield opportunities in Week 3, besting his previous high of 40 percent in Week 1. Mixon did well with his touches, too, totaling 101 yards on the day. Expect more of the same moving forward. Giovani Bernard and Jeremy Hill become sits this week as a result. Tyler Eifert is out for the foreseeable future with a back injury, but don't get cute and start Tyler Kroft in his absence. Kroft saw four targets last week, but unless that total starts climbing or he becomes a red-zone threat (he is 6-foot-6) there are better streaming options. The Bengals defense surprised with a solid 14 points on the road against the Packers and is a great play this week against DeShone Kizer, who has thrown seven interceptions and been sacked 10 times in 2017. While there are talented playmakers on the Browns offense, right now the best course of action is to avoid starting (most) of them until the roles become more clear. DeShone Kizer must face a Bengals defense allowing the fourth-fewest passing yards per game that averages over three sacks per game. Isaiah Crowell has received plenty of volume but has done squat with his chances. Among backs with 30-plus carries, Crowell is tied for the lowest yards per carry average (2.9) with Samaje Perine and LeSean McCoy. This could be why Duke Johnson's touches have increased each week so far, from two to seven to eight. I understand that's not a breathtaking total, but Johnson has been one of the lone sparks for this offense could be in line for some more work. He's on the PPR flex radar, while I'd bench Crowell until his matchup is more favorable (Bengals allow just 3.5 yards per carry) or we see him start producing. Nobody was more bummed about Rashard Higgins falling flat on his face than Matt Harmon. After looking ready for the spotlight in Week 2, Higgins retreated to the shadows in Week 3, dropping passes he should have caught. With this receiving group still seeking an identity sans Corey Coleman, all parts should be left on the bench. Same for the tight ends. I know it'll be tempting to chase David Njoku's back-to-back touchdowns, but he played fewer snaps than Seth DeValve last week AND saw fewer targets. The Browns defense gets a big ole nah wave in fantasy for now. Maybe once Myles Garrett returns we can talk (which could be this week). Through three weeks Jared Goff is the overall QB11 in scoring. He should be able to maintain that QB1 status this week against a Dallas secondary allowing 22-plus fantasy points per game to non-Eli Manning quarterbacks. Todd Gurley is a true workhorse for this backfield seeing all kinds of scoring opportunities (tied with Carlos Hyde for most inside an opponent's 10-yard line with 10). Those chances combined with his usage in the passing game (team-leading 17 targets) make him a weekly must-start. While Thursday night's game against the 49ers was a blast to watch, it certainly muddled the wide receiver group from a fantasy perspective. Sammy Watkins, Robert Woods, and Cooper Kupp have each seen 14-plus targets and have racked up 124-plus yards. Watkins is the best play of the bunch -- he leads the group in catches (13), yards (194) and touchdowns (two) -- though he is in the concussion protocol currently, so that must be watched. Also, it's worth noting that Goff has a perfect passer rating when targeting Watkins so far in 2017. Woods leads the group in playing time, but Kupp has the longer running rapport with Goff. Matchup-wise, the Cowboys allow over 60 receiving yards and a touchdown per game to the right wide receiver position, where Woods plays 51 percent of the time. The Rams are deploying a tight end committee, which isn't worth targeting in fantasy until a lead dog emerges from the pack. The Dallas offense rarely turns the ball over and controls the clock. They're a fantasy defense's worst nightmare, so I'd sit the Rams on the road. Dak Prescott has been a model of fantasy consistency with 15-plus fantasy points in each game so far this year, and multiple touchdowns in two of three contests. Brian Hoyer just shredded this Los Angeles pass defense, so Prescott should at worst offer a safe floor and at best push for a top-five finish. Ezekiel Elliott bounced back in a big way after a disastrous eight-carry, nine-yard performance in Week 2. Expect him to keep rolling against the Rams, who allow the second-most rushing yards per game and an average of 4.4 yards per carry to opposing backs. Dez Bryant is receiving 25.2 percent of Prescott's targets, and while he hasn't been wildly productive with that volume (11 catches, 114 yards, two touchdowns) he needs to be started. Cole Beasley is losing work to Brice Butler and Terrance Williams, damaging even his once strong PPR outlook. All three are too inconsistent to trust. Jason Witten's one-catch, three-yard performance is likely to turn away some owners, but he's still second among all tight ends in targets (26) and receptions (18). The Rams still have some protection issues and the Cowboys have the NFL's sack leader, Demarcus Lawrence, ready to rock. They're worth streaming. Carson Wentz predictably struggled last week against the fantastic Giants defense, but could bounce back in sunny Los Angeles this weekend. While the Chargers are allowing just 201.3 yards per game, their 6.1 touchdown rate is the seventh-highest in the league. With Darren Sproles sadly landing on IR, LeGarrette Blount and Wendell Smallwood become low-end flex options. We know Blount has touchdown upside as the goal-line threat, but Smallwood could inherit some of Sproles' passing game work (12 targets prior to injury). In the passing attack, Alshon Jeffery is the only trustworthy wide receiver on a weekly basis. He leads the group with 28 targets, 14 receptions, and 186 yards. He's also ninth in the league in targeted air yards percentage (37.7), per Next Gen Stats. The Chargers have allowed four touchdowns to opposing slot receivers this year, the most in the league, so Nelson Agholor is back in flex consideration. Torrey Smith could be a dart throw in deeper leagues, but I'd pass for now. Zach Ertz is three weeks into the breakout season fantasy analysts have been forecasting for the last three years. No sense in sitting him now, especially since tight end is a positional wasteland in fantasy. With so many injuries to the Eagles defense, this unit needs to be sat against talented offenses like the Chargers. The Eagles have allowed two straight top-12 quarterbacks (Alex Smith, Eli Manning), and their front seven will be without Fletcher Cox (calf). At home, against a battered defense coming off an emotional win, this is Philip Rivers' chance to get right. If he can't get going here, it might be time to move on from the current QB24. The Eagles are stout against the run (3.8 yards per carry allowed), but missing Cox will be huge. If Melvin Gordon (knee) is a full-go, he's in the RB1 discussion, as usual. Keenan Allen currently ranks fifth in targets among wide receivers (29), and has received even looks so far through every game (10, 10, 9). Travis Benjamin and Tyrell Williams have been cannibalizing each other's upside a bit, though this feels like a good game for Benjamin to get over. He's been lining up a fair amount in the slot (38 percent), and Sterling Shepard just cut through this defense for 7-133-1. Hunter Henry and Antonio Gates might be the best tight end duo in the league, but their usage is all over the place and both need to ride the fantasy pine. Henry has had two games without a target through the first three weeks. The Chargers defense is loaded with talented playmakers, but isn't getting it done in fantasy (partially because Rivers keeps turning over the ball). I'd sit them against the explosive Eagles offense. While Eli Manning had a nice game overall last week, roughly half of his yardage and two of the touchdowns came in the fourth quarter after the Eagles had been crushed with injuries. The Bucs defense is pretty banged up and Odell Beckham Jr. looks closer to fully healthy, but I'd still pass on Eli for now. I want to see him do it again over a full game before trusting him as a starter. About those Giants running backs ... moving on. OBJ is a must-start, while Sterling Shepard is a strong flex option. With the Giants trying to get the ball out of Manning's hand quicker to solve protection problems, Shepard is a primary target in the slot. Brandon Marshall still needs to be sat. Even though he saw 11 targets last week he turned those into a meager 66 yards. In this age of enigmatic tight ends, Evan Engram at least offers a reasonable PPR floor (9-plus points in every game). The Giants defense may be on the road, but Jameis Winston is still prone to gaffes and this opportunistic group could take advantage. Through three weeks, the Giants have allowed just one top-12 quarterback finish (Dak Prescott, QB12 Week 1). Jameis Winston has yet to score more than 16 points this season, so I'd sit him despite him playing at home. Jacquizz Rodgers gets one more week as the "featured" back before Doug Martin returns from suspension. He saw just five carries last week, but the Bucs were down big early and he doesn't really factor into the passing game. He's a low-end flex in a game the Bucs should keep closer, though I'd probably sit him if you can. Mike Evans remains a must-start, even if he draws coverage from Janoris Jenkins. Evans managed 7-67-0 against Xavier Rhodes last week, which is a solid floor with more touchdown upside in this one. DeSean Jackson should be flexed, as he remains a prominent part of the Bucs offense (seven targets each week) and is a big-play waiting to happen. Cameron Brate and O.J. Howard have been eating into each other's work, but Brate found the end zone last week and the Giants are vulnerable to the tight end position. Brate is stream-worthy but Howard is best left to the waivers for now. With several key starters injured, the Bucs defense is probably best left on the bench, despite facing Eli Manning on their home turf. Brian Hoyer is coming off an epic shootout on Thursday night football with extra time to prepare for a Cardinals defense that has allowed top-10 quarterback performances to every quarterback not named Jacoby Brissett that they've faced in 2017. The Cardinals are also coming off a tough loss on Monday night, with a shorter turnaround. Hoyer is very much in the streaming conversation in deeper leagues. Carlos Hyde is dealing with a hip injury but has been practicing all week and should be good to go. The Cardinals' run defense has been pretty strong, but Hyde's touches have increased in each week, from 15 to 18 to 28. His volume and passing game work (four-plus targets in each game) makes him a solid start. Marquise Goodwin hit a big play last week, but it'd be foolish to chase that low percentage hit again. Pierre Garcon is the wideout to play here, as he currently owns 25.5 percent of the team targets and leads the team with 249 yards. Other than that, I think we're done here. Over the last two weeks the 49ers pass defense has allowed just under 500 yards and four passing touchdowns with zero interceptions, and that includes a matchup with the moribund Seahawks offense in Week 2. Carson Palmer remains in the streaming discussion after a strong performance against the Cowboys. The Cardinals backfield remains a mess for fantasy purposes and should be avoided at all costs. End of story. Larry Fitzgerald just added more icing onto his Hall of Fame cake, I mean, career, last week and should be in a great spot here as well. With Jaron Brown and J.J. Nelson as legitimate threats on the outside and deep (as well as in the flex position for fantasy), Fitzgerald can move all over the field and dismantle opposing defenses. In Week 3 he gained 81 yards out wide, 44 in the slot, and 24 tight to the linemen. He should be a locked-in start every week. Brian Hoyer has been sacked two-plus times and thrown an interception in every game so far this year, making the Cardinals a great streaming option at home. Derek Carr was pressured for pretty much the first time all season last week, and the Raiders offense fell to pieces as a result. Denver's defense isn't pressuring the passers as much as in year's past, but they are at home and could pester Carr. Furthermore, Carr's history against the "No Fly Zone" Denver defense is bleak. Through five career matchups he averages 183.6 yards per game, 1.2 touchdowns per game, and 0.8 interceptions per game. I'd stream the position and sit Carr if you can. I love Marshawn Lynch to death, but he's only played 40 percent of the Raiders offensive snaps through three weeks and the Broncos are absolutely swallowing up opposing running backs. LeSean McCoy and Ezekiel Elliott combined for 21 carries and 17 yards against them the last two weeks. This doesn't bump up Jalen Richard or DeAndre Washington for me, either, as those two will split the rest of the work fairly evenly. As the great Rich Hribar of Rotoworld notes in his phenomenal Week 4 "The NFL Worksheet" column, in the four games Amari Cooper and Michael Crabtree have played together against the Broncos they average a combined 7.3 receptions for 72.3 yards per game with one total touchdown. Jared Cook might be the best fantasy play on this offense on Sunday. He's had five-plus targets and four-plus catches in every game so far, and the Broncos have allowed 16 catches, 136 yards and two touchdowns to opposing No. 1 tight ends over the last two weeks. If Crabtree and Cooper get shut down, Carr could look to Cook as a means to move the offense. Trevor Siemian rather predictably fell on his face on the road against the Bills defense (apologies if you followed me and still streamed him anyway), but he could bounce back this week against the Raiders. They're allowing 262.3 passing yards per game with five touchdowns and no interceptions. Jamaal Charles surprisingly split work with C.J. Anderson last week, and this was after Anderson put on a display with a 154-total yard, two-touchdown performance in Week 2. The Raiders are currently allowing the fifth-most total yards to opposing rushers (495), giving both Anderson (who I'd expect to lead the committee) and Charles some upside in the flex. Emmanuel Sanders and Demaryius Thomas own 29 and 25 percent of Siemian's targets, respectively, and account for 23 and 33 percent of his yardage as well. They should be locked into your starting lineup every week as that type of volume and usage is hard to ignore. The Denver defense at home is a must-play, even against a typically strong Oakland offense. However, Carr's struggles against Denver should ease concerns. With the Colts this week, we're really only focusing on three players as they travel into the teeth of a strong Seahawks defense: Frank Gore, T.Y. Hilton, and Jack Doyle. With Gore, the Seahawks have surprisingly been gashed on the ground, allowing back-to-back 100-yard games to Carlos Hyde and DeMarco Murray, and they currently rank 30th in Football Outsiders' rushing DVOA. Gore's carries have increased in three straight games, too, and he's a fine floor play in the flex. T.Y. Hilton returned to the top of the target pecking order for the Colts in Week 3 and shredded the Browns with seven catches, 153 yards and a touchdown. Hilton has only played the Legion of Boom once, but he absolutely demolished them in that contest for five catches, 140 yards and two scores. Historically, the Seahawks do struggle to contain smaller, shiftier, and speedier wideouts like Hilton, and I think he'll offer nice upside in the flex this week. Jack Doyle disappointed in Week 3, but still has seen 13 targets over the last two weeks. Brissett could look to Doyle frequently as a safety valve against the Seahawks intimidating front seven. Is Russell Wilson officially back? He sure looked good slinging the rock late against the Titans, but the Seahawks were chasing on the scoreboard at that point. Through three weeks, the Colts have allowed QB14, QB12, and QB12 performances to opposing passers, so Wilson's in a good spot to carry his momentum into a home matchup. With C.J. Prosise suffering a significant ankle injury, this is Chris Carson's time to shine. Thomas Rawls only saw one offensive play last week, and while he works his way back to full health that could make Carson the true featured back here. The Colts have been OK defending the run, but they built that up "slowing" down Todd Gurley when the Rams were up big in Week 1, and by facing a David Johnson-less Cardinals squad in Week 2. Doug Baldwin seems like he'll be good-to-go for this one, and if he plays he's a must-start. His owners should look to add Paul Richardson or Tyler Lockett if they're available, as both would fall into a bunch of targets. For now, they're deeper flex options as both have big-play potential. I'm not enthused with starting Jimmy Graham while he's battling an ankle injury, but he did catch seven of 11 targets last week. That's hard to pass up in this tight end market. The Seahawks defense figures to be angry and welcomes Jacoby Brissett on their home turf. Fire up the Legion of Boom. 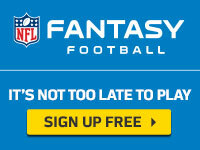 It's not too late to play NFL Fantasy! Join or create a league for FREE. -- Follow Alex on Twitter @AlexGelhar or "Like" his page on Facebook for more NFL and fantasy analysis.